Apple Jack Creek: Pink. Purple to be added shortly. The PTSD fatigue has, up until recently, kept me too tired to spin at the wheel (thank goodness I found supported spindles - I can still spin, even when I’m too tired to treadle!) … but today, the mood finally struck. Jacqueline and I decided to play. I spun two bobbins of hot pink hand dyed Tunis (actual woolen prep rovings from the local mill) - about an hour per bobbin. I was aiming for something I could use in a 2 ply for socks, and I think I got it. I plyed on my Norwegian (since she has no issues going backwards, and that meant I only had to wind off once onto a Lazy Fred storage bobbin). The finished yarn is now back in the dyepot soaking up some splotches of purple. Ah, here we go: out of the dyepot. 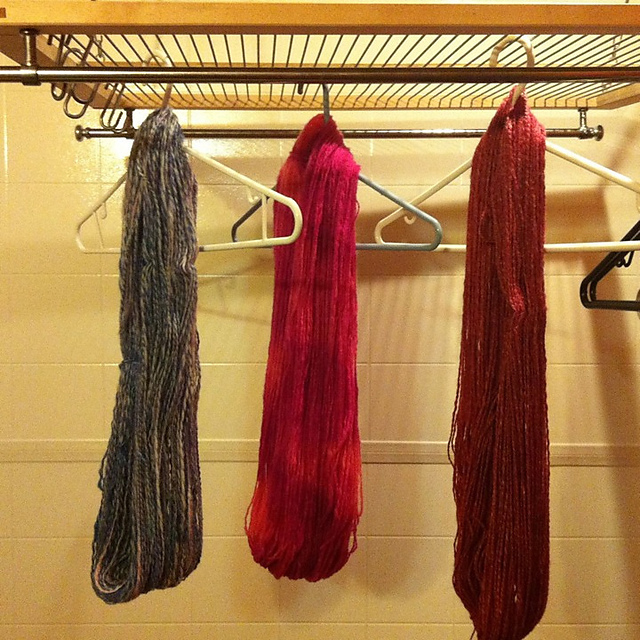 Left to right: great wheel spun blues plyed with spindle spun whitish singles; hot pink and purple sock yarn; garnet silk/merino, spindle spun. They do represent Spring very well! It really isn't too far away! Enjoy knitting it up! I hear you on the "spring time hurry up"s! :) LOvely spinning and the bright cheerful colors!